VFL R17: Recap Watch Luke Mason and Peter Marcato provide a recap of Collingwood's 50-point win over Geelong at Victoria Park. 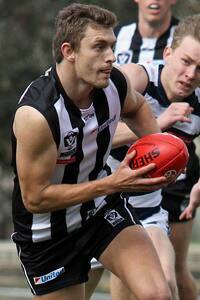 Adam Oxley impressed in the first half in Collingwood's VFL victory over Geelong. Photo: Shane Barrie. Momentum continues to flow for the VFL Magpies who on Saturday won their ninth consecutive game with a 50-point victory over Geelong. Five goals to one in the first term set an early pace which was maintained throughout the course of the match. Collingwood added another five in the second term, before running out winners 13.14 (92) to 5.12 (42). “It was a good performance by the boys,” returning forward Mason Cox told Collingwood Media post game. Having an extra 211cm in the shape of Cox back in the team, the Magpies immediately looked dangerous up forward. And the ball spent the majority of the first quarter in Collingwood’s forward line, with the midfielders winning the clearances 17-5 before the first break. After playing 10 consecutive games in the AFL, Cox hasn’t taken the field at all in the last three weeks. He was rested, then met the US Vice President, then was faced with the VFL bye before taking the field at Victoria Park. “I feel pretty refreshed,” he said post-game. Fans arriving at Victoria Park to see Cox and his VFL teammates were subject to disappointing news upon arriving at the ground. Tim Broomhead and Matthew Goodyear were out of the final side, meaning Collingwood’s AFL contingent was cut from 12 to 10. It also meant the return of a VFL-listed Magpie unsighted so far in 2016. He’d spent time in recovery, and even in the commentary box, but on Saturday Callum Matheson’s return to football was the most influential – kicking two goals in the second half. Nick Gray, Adrian Indovino and Cox joined him as multiple goalkickers, as Gus Borthwick, Jordan Kelly, Corey Gault, Adam Oxley and Lachlan Ferguson added singles. For Oxley, the match provided a rare chance to try his hand as a forward. The Queenslander played in front of the ball before leaving the ground at half time as a carry-over AFL emergency. After being shut out of the game for so long, Geelong finally held its own in the final term. The Cats outscored their favoured opponents 23-21 in a last quarter missing the intensity shown in the rest of the game. Former Geelong Falcon Ben Moloney was named Collingwood’s best player, and was joined in the best players by Brent Macaffer and Tyson Goldsack. The Magpies will play a second straight home game next week when Coburg visit the Holden Centre.